Fri., July 27, 2018, 8:49 a.m.
QUNEITRA, Syria – Syrian government officials and lawmakers celebrated Friday with music and an official flag raising ceremony the recapture of this symbolic southern town adjacent to the Israeli-occupied Golan Heights from armed groups that controlled it for more than four years. 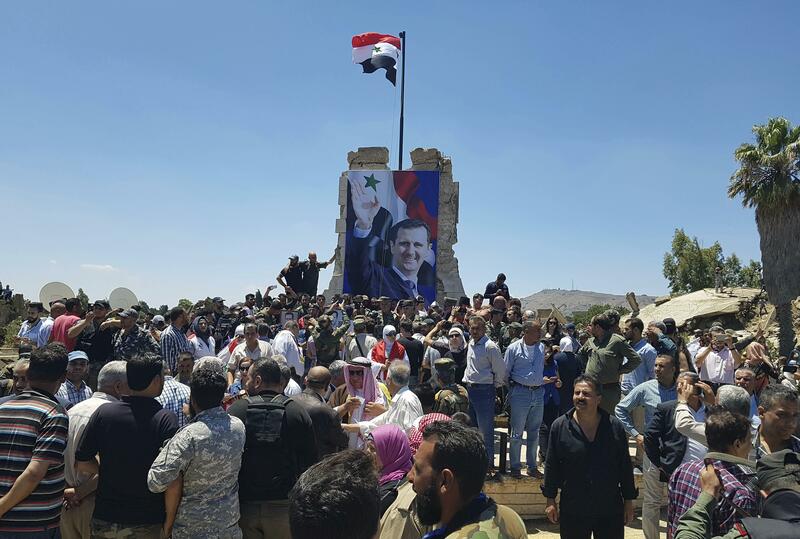 The picture of President Bashar Assad was hoisted on a partially destroyed monument in the town’s center, where his father more than four decades ago raised the Syrian flag after Israel withdrew. “We are happy to regain control of the crossing…It was a dream to restore control,” said a field commander, speaking on condition of anonymity in lines with regulations. The Britain-based war monitoring group, the Syrian Observatory for Human Rights, said that with the government’s control of the town and crossing, only a handful of villages in Quneitra province remain outside of government control. Dressed in the ethnic minority Circassians’ traditional garb, the 40-year old said he was “ecstatic” to return to the capital of his native hometown. Published: July 27, 2018, 8:49 a.m.